Welcome to Comprehensive Dermatology of Long Beach. Our mission is to provide our patients with the highest standard of medical & cosmetic skin care in a warm and professional environment. Choosing the right dermatologist is an important decision. Did you know that skin cancer is the most common form of cancer in the United States? There are more cases diagnosed annually than all cases of breast, colon, lung & prostate cancer combined. Every adult man & woman should have yearly skin cancer screenings by a board certified dermatologist. Early detection is key: survival rates for early-detected melanoma are almost 99% but the rate falls to 15% for those with advanced disease. We are trained and dedicated to making sure our patients get the best medical care to treat and cure debilitating and even deadly skin diseases. We also love to help patients improve their skin so that they appear more radiant and feel more confident. You should not compromise in any part of your health care including your dermatologic care. We look forward to helping you to achieve your skin care goals! 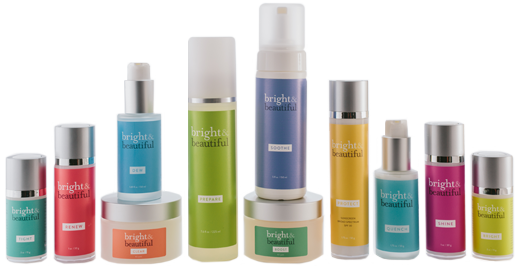 We’re thrilled to share with you bright&beautiful our newly launched skin care line.